A staple in many people’s wardrobes is compression socks. Not only do these have a profound impact on your ability to get around but they also affect your mood. 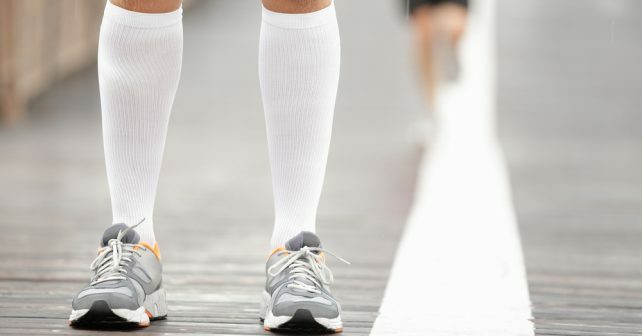 Compression socks are very common among highly-trained athletes and travelers who have circulation difficulties. 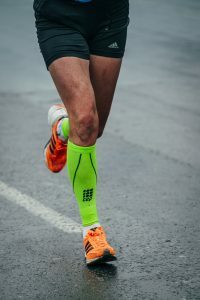 The tightness of these socks give support to both your legs and feet, increase blood flow, and lead to a more productive run and pleasant plan ride. The following compression socks have catered to the soles of many. 2XU’s Vectr Cushioned No-Show Socks are designed to prevent common foot ailments such as plantar fasciitis, which causes intense pain in the sole of the foot. These no-show socks provide “X-LOCK” stabilization for your foot and ankle, which reduces a lot of foot problems. Vectr socks featured zoned mesh panels that increase breathability and soft cushioning to absorb impacts. In addition, these nylon and lycra-blend socks come with extended heel tabs to protect your feet from blisters. Polygiene® is used to control odor so you can move around in style and freshness. Reebok’s graduated compression sock is knee-length so they can provide support for your foot, ankle, and calf. Designed with graduated compression these are tight in the right places, giving you support where you really need it. Made of Microfiber Nylon and Spandex these sharp red and black socks are able to manage moisture, provide durable support for the heel and toe through the reinforced fabric, and great style so you can walk around without having to sacrifice your comfort. Comrad’s companion compression socks are built for more than just fitness. They are made to assist the circulation of those who have office jobs and sit a lot throughout the day. With greater circulation, you can experience less pain and greater mood during your work day which may make you more productive, and overall, pleasant to be around. These socks come in a variety of colors including white on navy, black on charcoal gray, deep navy on lilac, and red on navy. High-quality, these socks are made of spandex and nylon. Comrad uses 15-25 mmHg Certified Compression to give you therapeutic pressure that gradually eases up the leg from the ankle to the knee. For your all-day comfort, these socks stay in place and won’t leave deep lines in your skin. Built with smart fabrics, you will get the benefit of moisture wicking and temperature regulation that will stay odor-free and antimicrobial even if you keep these socks on for days. CEP’s short socks come in a lot of stylish colors and designs. Unlike most companies, CEP’s vision is to create compression gear, so they are an excellent company to consult for the newest technologies. Affordable and comfortable, these short socks provide support and extra cushioning for those areas that are prone to blisters. With compression gear, their focus, CEP, has done a lot of research on the areas of the feet that get the most pressure. CEP’s compression socks come in a variety of fun colors, such as lime, Hawaii Blue, and Deep Ocean. Built with metatarsal compression, these socks fit perfectly in the mid-foot region during all sports including football, golf, and running. Not to mention, the targeted compression supports the instep to eliminate swelling. These are made of Nylon and Elastane. Asics’ compression socks are fully in-tune with their vision of high-quality socks that support long-distance running. Their recovery socks have specific functions that target your left and right feet for the best recovery. Asics is well aware that pressure points on the feet may be different. These amazing socks are made of polyester, nylon, and spandex. With energy compression socks as stylish as their shoes, Adidas has released socks that can effortlessly transform from ultra supportive compression socks to everyday wear without a blink. No more will you have to change your socks to hang out with your bros, just keep these on. These socks are available in core red, reflective silver, and mystery red. Adidas’ techfit® targets the energy of your muscles to help you reach maximum power, endurance, and acceleration. In addition, the flat toe seam reduces friction and irritation of the skin. New Balance’s reflective compression socks are excellent for those late-night runs. Replete with reflectors that go from mid-calf to top-calf you will be easily seen by any cars that come upon you. So, put in your headphones and other reflective gear and run in comfort without the worry of danger. These solid compression socks are excellent if you are prone to swollen ankles or sit more often than you stand. Built with a medium tightness, you’ll remain comfortable throughout the day. These black socks are made of high-quality cotton and are designed using a 200-needed count that provides comfort and flexibility. The 15-20 mmHg compression is great for all-day wear. With these socks, you can see benefits such as energized legs, reduced swelling, achiness, heaviness, and better muscle recovery. Nike’s elite lightweight compression socks are designed to up your running game. With a lot of structure in the calf, these sleek, stylish, compression socks help reduce injuries to your calves. Sigvaris created Insignia compression socks to leave you in comfort while on plane rides. Traversing your toes to above your calf, these socks have a long history of providing comfort and improving circulation when on planes. Compression socks are a great way to get comfort from many of the ailments that can affect your feet, ankles, and calves. These socks come in many sizes and pressures from light to heavy. For your benefit, go out and try a pair. Or two.